A wide variety of native plants thrive in North Idaho, an area located north of the Salmon River. Native plants also work well in gardens since most of them tend to be drought-resistant, thus requiring little watering even in hot, dry spells. For gardeners who want to include native plants in their gardens, avoid digging up plants from their native habitat and transplanting them to your garden. Instead, take a trip to the local nursery and see what they offer. Also known as Western columbine, this plant thrives in USDA hardiness zones 4 to 8. Columbine prefers partial sun to full shade along moist meadows, streambanks or in forested areas. The plant grows up to 24 inches in height, featuring broad green leaves and long stems from which orangish-red flowers dangle in late spring to early summer. Hummingbirds and bees find columbine very attractive as a food source. Dainty star-shaped flowers at the end of long stems distinguish this plant from another with a similar name, Solomon’s Seal. Also known as starry false lily of the valley, the plant thrives in moist soil, growing up to 24 inches in height with stems of alternating narrow green leaves. The plant thrives in hardiness zones 3 to 8. Clusters of bright white flowers appear in late spring and are replaced by a small berry with purple or black stripes. The berries turn bright red when ripe and attract a variety of birds including ruffed grouse. Native Americans collected the ripe berries for food. Wild Strawberry (Fragaria vesca bracteata). Found in open areas of the woods, wild strawberry offers tasty fruits on plants that reach just eight inches in height. 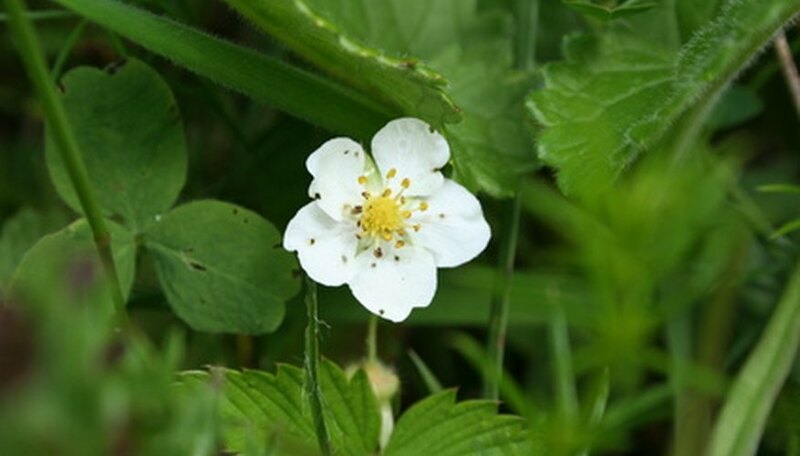 Growing in hardiness zones 3 to 8, wild strawberry plants feature clover-like leaves with white flowers in spring. The flowers fade into small green berries that turn red in early summer. The plants thrive in full to partial sun in well-drained soil where they spread via runners. The plant works well as a ground cover to help curb mild erosion. A wide variety of birds and small mammals find the fruits provide a great food resource. Sporting dark green, heart-shaped leaves, wild ginger reaches less than one foot in height, but spreads up to three feet wide. The plant grows in hardiness zones 4 to 8, featuring dense clumps of leaves that hide reddish-brown, bell-shaped flowers that bloom in April through August. The flowers get pollinated by ants and other insects that crawl into the flowers. Wild ginger thrives in shady areas where well-drained, acidic soil exists. The plant spreads aggressively, making it a great ground cover. Colonists crushed the stems and leaves to use in place of real ginger. What Kinds of Fruit Grow in the Catskill Mountains? Do Foxes Eat Both Plants & Animals?